Writing case has gusseted section with 3-section organizer, slots for CD jewel cases, diskettes, and business cards. 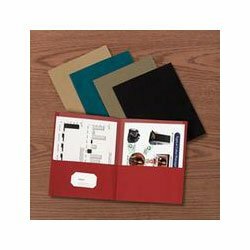 Die-Cut and embossed portfolios with a marble-patterned cover sheet to customize with any Inkjet or laser printer. 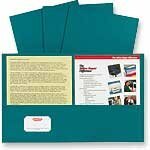 Features a roomy pocket with a die-cut business card holder. Twin pockets with die-cut for business card holder. 100% recycled fibers; minimum 30% post-consumer materials. 25 portfolios per box. 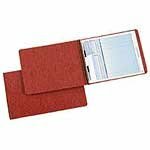 Letter-Size pad holder features top center brass-finish clip to securely hold tablet and loose papers. 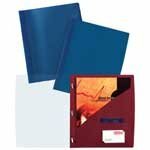 Inside front cover features patented Expand-A-Pocket that holds a generous amount of papers. Suede-Lined inside front cover has flap pocket, two card holders and pen holder. Letter size pad is included. Twin pockets hold all of your documents securely. Inside front pocket features a convenient business card holder. Assortment includes light green, yellow, tan, orange, light blue and red. Combines tradition with quality construction. Each piece is crafted with the look of leather, has hand turned and sewn edges, and is finished with brass corners and hardware. 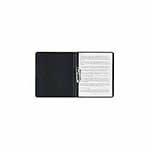 Inside front cover has full document pocket, business card/diskette pockets and pen loop. 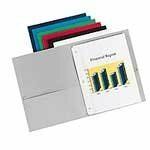 Colored, translucent portfolio has two pockets and business card slot. Translucent polypropylene material provides the durability and style required for exciting presentations or general office use. Holds 11 x 8-1/2 sheets. The alternative to traditional hole-punched reports. 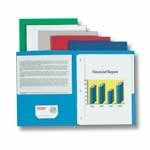 Simple, sliding binding clip easily secures up to 30 pages.